The past years have lead to an increased interest in an old, but pretty rare and uncommon leopard gecko morph – the Ghost. Many myths and incorrect information about them abound on the internet. 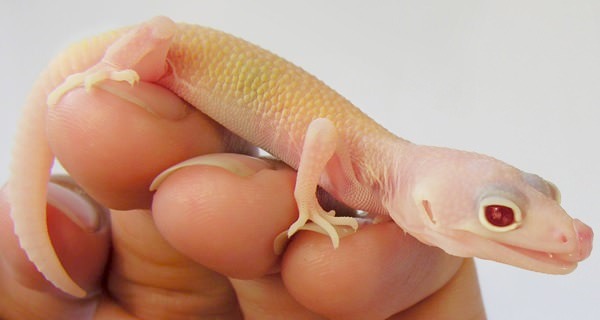 As one of the few breeders who has been working with and improving them for years, this article will provide some of Dragoon Gecko’s findings. Hopefully with this article, we will be able to go into detail about them, answer some questions, present facts and help to clear up some myths. 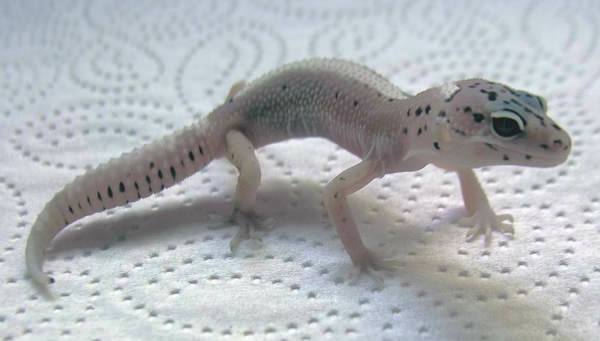 The Ghost is often described on the internet and in literature as a mutation causing “faded colors” in the leopard gecko. In fact, this rough description is only a part of the whole picture, as there’s much more to a true Ghost than that. Read further on and you’ll see why ;-)..
Is the Ghost a true genetic color-morph? 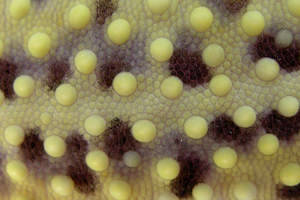 Although belonging to the “old school” morphs, for a long time Ghosts were simply seen as a variety of weird pastels, or especially a form of Hypo-colored leopard geckos in the community. A possible explanation might be that the very first Ghosts emerged from a Hypo-line, and therefore naturally shared many phenotype similarities in their early years on first view. On the internet we can even sometimes read that the ghost gene itself will cause a form of Hypomelanism. Dragoon Gecko however has easily created various forms of animals over the years that display a huge amount of black spotting, such as our “Speckled Ghosts” project. In fact, the breeder can influence the black pigmentation in the Ghost the same way as in other color mutations (e.g. tangerines). The similarity of genetic and phenotypical results in different breeder stocks soon lead people to the conclusion there might be more to the whole story than a slightly different form of a Hypo. Due to the results and findings of various breeders in US and Europe, the Ghost has proven over the years to be different from pastels and hypos, and a true genetic color-morph in its own right. The Ghost was first mentioned in 2004 in “The Leopard Gecko Manual”, p.66 (Philippe de Vosjoli, Roger Klingenberg, Ron Tremper, Brian Viets) and finally described 2005 as “the result of genetics” in Ron Trempers Book “The Herpetoculture of Leopard Geckos” (p.159). What colors do we find in Ghosts? The exact coloration of a Ghost will depend on many things, and by far not all crosses have been done yet (a fact that makes them interesting and valuable for the future!). In general, the Ghost-Gene will “change” any morph it is combined with, and in a small way unlock new looks just like the Enigma and W&Y- gene will do. We have seen unusual things over the years such as a black (!) paradox marking in one of our albino Ghosts, irregular eye pattern, or different colored hind legs (1 white, 1 yellow) in one of our Mack Snow Ghosts. As mentioned above, in Dragoon Gecko’s breeding stock we see a tendency for non-albino animals to often display a rich green coloration, which in many cases is more distinct than in the current Emerald projects. The color ranges from a light sea-green to an intense dark military green and everything in between. From what we have seen until now, albino Ghosts seem to display more of a light yellow, or a pastel yellow-green coloration. Many crosses are yet to be attempted though. Crossed into snow lines, Ghosts can help to enhance the amount of lavender in an animal, and combined with the Montanus-line (which is also known for its potential to lighten up animals), very light Ghosts were born in our stock that looked like snows, where no snow-gene at all was involved in the project. I am not totally convinced right now about this point, but based on the current information available it seems that the Ghost-gene is able to at least partially block or cover bright yellow -, orange- and red pigments, as we have rarely seen any true genetic Ghost with a carrot tail, and never hatched out a genetic Ghost with bright yellow/orange coloration in our stock. Stronger than in any other trait, Ghosts can change their colors from “ultra-light” to “smoke dark” (some animals almost look as if they were covered in black ash) depending on temperature, time of the year, and also current mood. Many of my older Ghost breeders become lighter and lighter each season after 3 to 5 years of age. A ghost never stays the same – another point that makes them fascinating for breeders to work with. 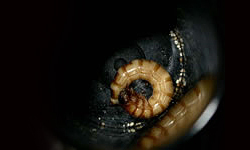 It is often said that Ghosts are hard to recognize until they reach a size of 5 to 6 inches, and that they are generally hard to recognize as hatchlings. While I find this statement true for beginners, it is definitely getting a lot easier to distinguish Ghost babies with growing experience. 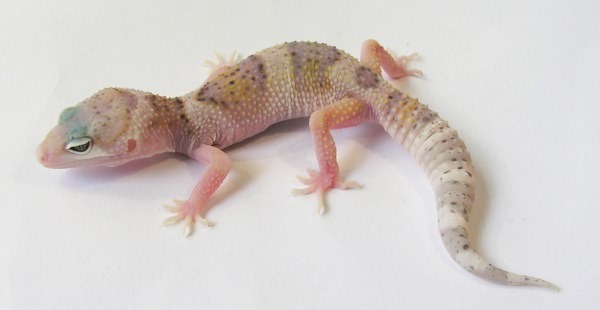 This is why I recommend that everyone interested in working with this trait to choose your breeder wisely, and to make sure your geckos are coming from a genetic Ghost-line. Good breeders should verify where the animals are coming from, and should choose the best suitable offspring for them and their projects. In combination with Snow, a Ghost can be easily distinguished from its normal siblings right after birth, as Snow Ghosts do not hatch black and white, but with a brownish/deep purple and white combination. Those Snow Ghost- babies will lighten up to a kind of “milk & coffee” pattern within their next few sheds, and finally end up with a mixture of green, white and lavender. Other Ghost combinations may require an educated eye to distinguish them from normals as hatchlings. But usually after the first sheds it will (like some W&Y’s) become obvious who is who, as all Ghosts have a unique pastel and faded appearance that visually clearly differs from bright colored non-Ghost animals. To date, there is unfortunately no verified information available on the exact origin of the ghosts. Some people believe that the very first Ghosts emerged in Ray Hines breeding stock at a time when he was predominantly working with the hypo morph in his breeding program. Others say they popped up in Alex Hue’s Hypo project. They definitely became popular by Alex Hue from AlexHueReptiles in the US, probably around the early or mid 90’s. When Alex began to sell his Ghosts to other breeders, they were used to cross into other projects, but soon got off many people’s priority list when newer mutations such as the “Raptor” conquered and excited the market. In the years that followed, they became almost forgotten — but suddenly returned with a bang in the gecko community when the very first amazing Mack Snow Ghost Jungles hatched out in ArtlinksGecko’s breeding stock in Sweden, Europe 2007. Dragoon Gecko acquired the first banded Ghosts directly from Alex Hue’s stock, and we have been breeding them ever since. Eventually, we were lucky to get the first Mack Snow Ghost Jungles in 2007 from Artlinksgeckos, and were later entrusted with the whole project. Their original Breeders “Izidor” and “Dove” (bred by Alex Hue) and their beautiful Jungle offspring “Merlin”, “Andvari” and “Gletta” became founders of a new generation of ghosts, and are ancestors of almost all our modern crazy “Jungle Ghost”- stuff. Our founder male “Izidor” is still very active in our breeding program, and due to his potential to pass many positive features to his offspring (like general vitality and fertility) he is a male that I enjoy using in various projects. His children and grandchildren became some of our best Lavender Ghosts. We also got some amazing animals from Karsten Griesshammer’s Giant Ghost Raptor-Project in 2010, which became founders of our Giant Ghosts and Montanus Ghost Raptors. 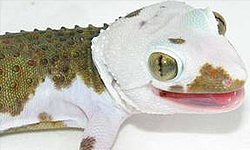 In general, Dragoon Gecko worked intensively over the past years to improve the colors and patterns through genetic management and selective line-breeding: the first original Ghosts appeared very dark and washed out or muddy in coloration, so we focused on clearing up the colors, sharpening the contrasts and “lightening them up” from generation to generation. We also crossed them into various projects and lines, and created combos such as Giant Ghosts, Ghost Eclipse & Ghost Raptor, Speckled Ghosts, Hypermelanistic Ghosts (what some of our customers like to humorously call “Smoke Ghosts”), Ghost Albinos, Montanus Ghost variations, Mack Snow Jungle – and Stripe Ghosts, Lavender Ghosts and more. We continually plan to produce some new combination with them (e.g. this season will focus on W&Y Ghosts), so there’s always work to do and still room for improvement ;-). ♦Non-ghost sibling x non-ghost sibling: Due to the limited size of our breeding stock, we have not tried this combination yet. Due to the simple fact however that we both hatched out Ghosts in even every real outcross-pairing, I highly doubt the Ghost to be simple recessive (= non-ghost siblings to carry the ghost trait). As a consequence, we at Dragoon Gecko do NOT sell any of our normal ghost-siblings as “het” for Ghost. SuperSnows hatched from this combo will not look different from other Supers. The SS gene seems to block the Ghost gene , or at least cover over it so it becomes invisible in the phenotype. This is the reason why Dragoon Gecko prefers not to cross two Mack Snow Ghosts to each other, as we feel responsible that our customers know what they are getting. In general, due to the focus of Dragoon Gecko’s breeding program for physical strength, vitality & fertility, I recommend using outcrosses in every generation of the Ghost projects ( = Ghost x any other unrelated animal/morph). Are there any known neurological issues observed in Ghosts? We have never seen one in all the yearswe have worked with them (both from ghost x normal & ghost x ghost- pairings). In terms of my personal findings, two Ghosts can be bred to each other without concern. However, as said above due to the fact that only one parent is needed to produce ghost-offspring, I prefer to use unrelated animals whenever possible for a larger gene pool. What Ghost- Projects is Dragoon Gecko currently working with? ♦Montanus-line Ghost – some of these display a 3 dimensional eye mutation, very light and pastel colors, and great tendency for paradox markings! ♦Speckled Ghost — one of our first traits crossed into the ghosts. I personally like the contrast of clear coloring and fine spotted pattern -like salt and pepper ;-). What makes the Ghost so interesting for the future? In my opinion, Ghosts are the true “chameleons” among the color morph leopard geckos. That really makes them fun to work with: they will always change colors based on their current mood or the time of the year etc. and therefore surprise their owner with a kaleidoscope of different color shades through their whole lives. They never stay the same and will one day look almost anthracite black, and the next day surprise you with ultra-light colors. I also really like the fact that the ghost is clearly a single mutation- BUT with a strong chance for selective line breeding: You can create very dark or very light green animals, you can hatch out crazy looking albinos with pastel colors, you can selectively breed them for having almost no or huge amounts of spotting, for lavender, crazy patterns etc. The combination potential for them is endless, and we have yet to see many Ghost- combos ;-). Last but not least I cherish that whatever you will cross into the ghost will change the phenotype of the original line crossed into them, so you never know what surprise might await you in the incubator ;-). There’s still so much to try out and find out about the ghosts!! Many morphs and combos haven’t been crossed into them yet, so in my eyes this is a huge chance for anyone seeking unknown genetic endeavors ;-). I am eager to see what an Emerine Ghost or Super Giant Ghost will look like – not to imagine W&Y Ghost Bells or Rainwaters ;-). Rebecca Hassler studies veterinary medicine and has a great private interest in genetics and reptile medicine. 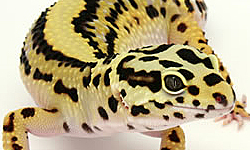 She has sucessfully worked in the standard fish breeding scene before she got her first leopard gecko in 2000. Together with her study colleague Martina Konecny, Rebecca runs www.dragoongecko.com where she is not only focused on linebreeding and polygenetic traits in leopard gecko color morphs, but also tries to sustain several old and valuable bloodlines for the future. This article was very interesting to me… How would I go about buying a ghost male to breed to my tug snow? I want to be careful to make sure it is a true ghost!